July 31, 2018 saw the official ribbon cutting for Cherry Creek School District’s (CCSD) Middle School #11, now known as Infinity Middle School. It was a proud moment for the Shaffer Baucom Engineering & Consulting (SBEC) team, celebrating the successful completion of another project for a valued client. The event was well-attended by nearly 500 soon-to-be new students, parents, administrators, teachers, and some of the school’s design and construction team, including representatives from CRP Architects, Bassett & Associates construction company, and SBEC. Having exceeded CCSD’s expectations for this project, SBEC’s Senior Mechanical Engineer Chris Cipriani was among a handful of facilities, design, and construction team members presented with individual plaques during the ribbon cutting ceremony in appreciation of their dedication to helping fulfill the school’s mission “to empower, to inspire and to innovate”. Infinity Middle School’s new Principal, Marquetta Thomas, presented the awards. 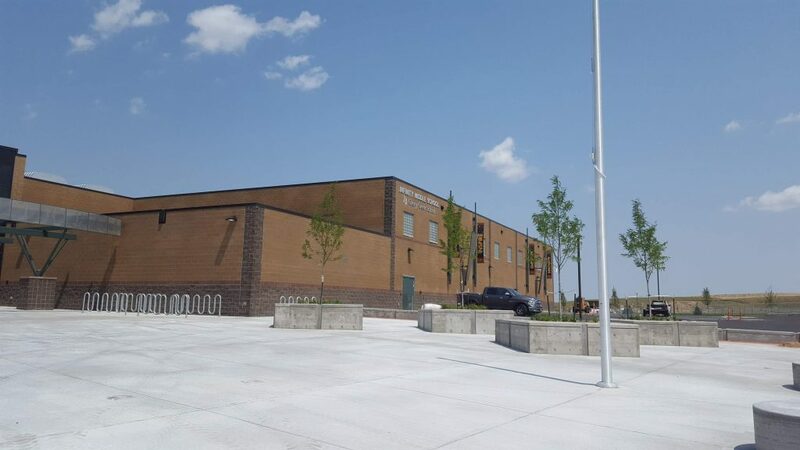 Infinity Middle School was designed with technology and innovation at the forefront, encouraging a love of life-long learning for the students who will pass through its doors beginning on August 13, 2018, its official opening day for the 2018-2019 school year. The 147,000 GSF facility is a product of the voters’ passage of a 2016 school bond. The school boasts an interactive media center, collaborative learning spaces, and classrooms equipped with the latest in technological advances, setting up the next generation of students for success.